How is Revlyn Demolition & Recycling able to offer such efficient, environmentally friendly demolition services? It’s partly because of the knowledge we’ve gained through 40 years of experience in Alberta, Saskatchewan, British Columbia and the Northwest Territories, but it’s also because we use state-of-the-art equipment that’s perfectly designed for tearing down structures and preserving the materials. Our concrete crunchers provide maximum demolition efficiency and cause only minimal noise and vibrations. They won’t disrupt the entire neighbourhood, meaning that they’re perfect for areas where disturbance must be kept to a minimum (such as near hospitals). Our three concrete crunchers have jaw openings ranging between 9 inches and 39 inches, and can provide long reach of up to 55 feet. Our quiet concrete crunchers are perfect for concrete cutting in Edmonton. This involves breaking down the concrete into recyclable pieces that can later be used as gravel or aggregate in new concrete. 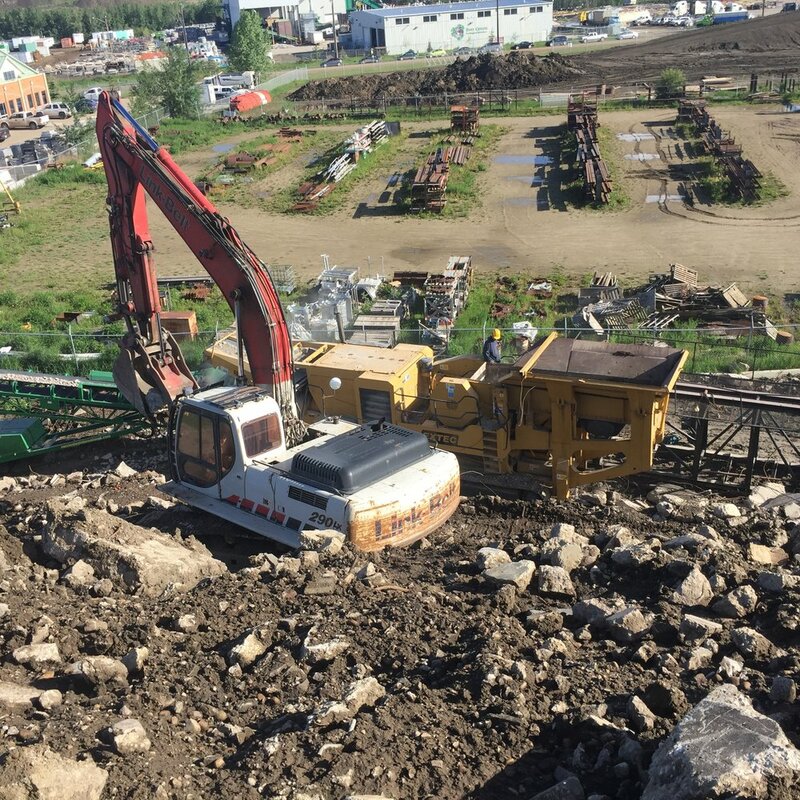 Revlyn Demolition & Recycling is proud to offer a sustainable method of demolition to Edmonton and the surrounding areas. Not only does our concrete cutting limit cleanup, it also helps the environment. We also have excavators between 8 tonnes and 50 tonnes to do any size project, and our hydraulic hammers help with building demolitions. For steel structures such as bridges, we can get metal shears that cut with a force of 300 to 900 tons and have jaw openings of up to 32 inches wide. We have access to metal shears with 300 to 900 tons of cutting force and jaw openings of up to 32 inches. These provide a quick and cost-effective way to break down steel structures. These powerful shears make us a great choice for metal bridge demolition projects. Watch our equipment in action in these short videos. To hire our experienced staff and heavy-duty demolition equipment, get in touch with Revlyn today. We’re bonded and ensured and we’re rigorous about our safety policies.